When I was growing up in the States, rosé had a reputation for being a second rate wine. I don’t know why that is. However, in St. Martin (the half French, half Dutch island) I noticed it everywhere, restaurants (including upscale ones), beach bars, house parties, etc. Once my parents moved back to the island, my siblings and I started to spend more time there. My sister, Daniella, LOVES rosé and would insist on stopping by a wine shop to stock up for our stay. Now, thanks to Daniella, I am a big fan of getting my rosé on the minute the warm weather arrives. Certain words and images come to mind when I drink rosé: summer, family, friends, good food, beaches, the Caribbean, outdoor seating in my favorite piazza, France, Sicily, parties, pink. Some rosés at a fantastic wine shop, Comptoir France, in Rome. Here’s a write up about rosé from The Kitchn. Arlene, you are preaching to the converted here. 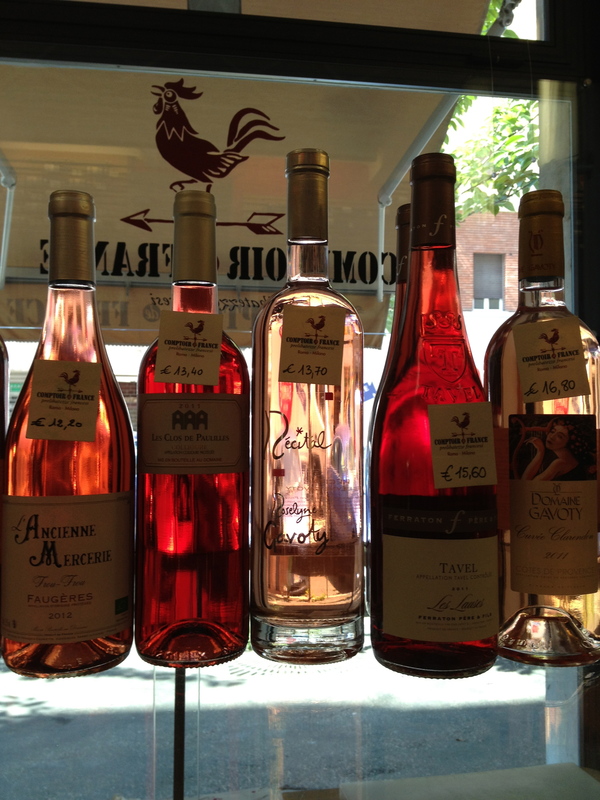 I adore rosé and just came back from Corsica with a crate of bottles! Yes to Corsican sunsets with a full pinkish glass – I’m missing it something terrible! I could kick myself for not getting into rosé earlier (although maybe that’s a good thing?). I have never been to Corsica. It, along with so many other places, is on my list. Ah, the ever underestimated rosé … I always liked it though. Nowadays a rosé prosecco (or Champagne if you are into French stuff) it’s very chic! Yes, it is! Looking forward to having some later next week. I blame it on the White Zinfandel!